John Fletcher (Jack) Barlow Passed away in is 99th year on 14 July 2015. Jack’s 60 years of Rotary service can be epitomised by the Rotary motto of Service above Self. He was an outstanding Rotarian who was always quick to put his hand to plough in the interest of improving the quality of life for others. Jack demonstrated a servant heart and took great satisfaction in seeing positive differences made in the lives of those in our community. He first joined Rotary 1955 at Te Kuiti and remained there until 1964 when he transferred to Taumarunui and joined the club there. 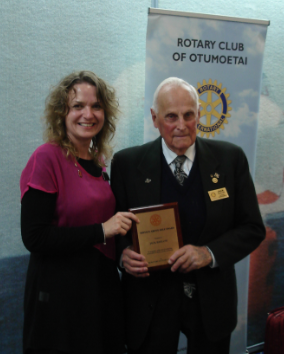 In 1976, after moving to Tauranga he was welcomed to the membership of the Rotary Club of Otumoetai. Jack has served as Club President, was made a Paul Harris Fellow, and has been awarded two Sapphire pins in recognition of his tireless work and contribution to people and communities in need. He has he left a legacy of service and inspiration to others. Rotary is without reality until men and women translate it into their lives and the lives of others, that’s exactly what Jack Barlow did. He will be sadly missed by many.